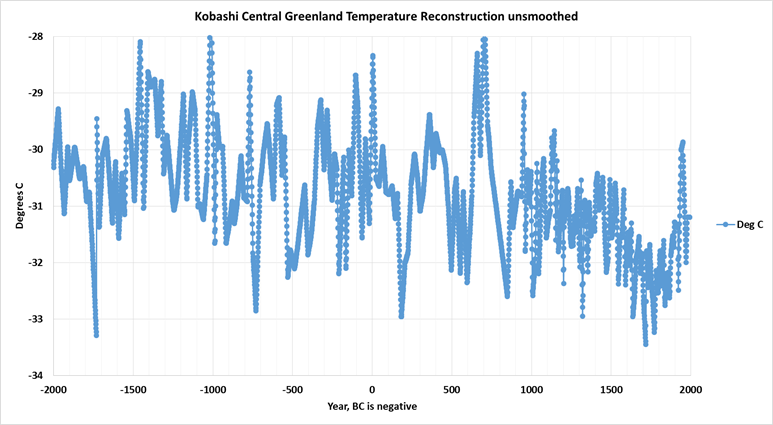 Comparing the Kobashi and Alley Central Greenland Temperature Reconstructions | Watts Up With That? In 2000, Richard Alley released an ice core temperature reconstruction for Central Greenland using Oxygen isotope ratios. He describes the technique used here. I used this ice core proxy data in a previous post “Climate and Civilization for the past 4,000 years.” Since Alley’s data stops at 1855, I spliced the Greenland HadCRUT surface temperature data on the end to show the Modern Warm Period. In the previous post I erroneously thought Alley’s reconstruction stopped at 1905, not at 1855, so the plot in the earlier post is shifted 50 years. This problem is corrected in this post. 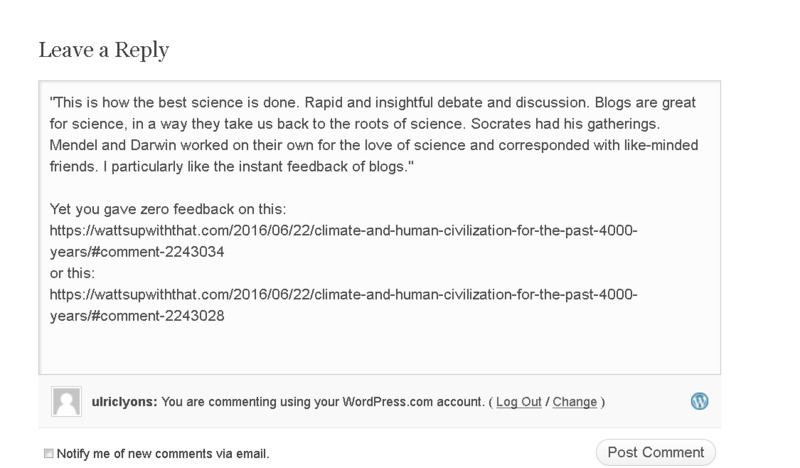 I spent too little time on the splice, since my focus was on the effect of climate on civilization and several commenters rightly objected to the error. These included David Middleton, who offered up a better Central Greenland reconstruction by Kobashi, et al. as an alternative. A little research and I was able to find a 4,000 year reconstruction to 1993 by Kobashi et al. Kobashi uses Argon and Nitrogen isotopic ratios from air bubbles in the ice to estimate paleo-temperatures. He claims that that his method is more accurate than the Oxygen isotope ratios Alley used. Details of Kobashi’s methods are in his PhD thesis, which can be seen here. His unsmoothed results from 2,000 BC to 1993 are shown in Figure 1. It certainly has a higher resolution than Alley’s dataset. It also has major differences at 700AD and 400BC. Figure 2 is the Alley dataset and the HadCRUT 4.4 surface data corrected for the 50 year error in my previous post. The HadCRUT 4.4 central Greenland temperature anomaly record (in red) is adjusted to the Kobashi record average from 1876-1967 after smoothing both reconstructions. This makes the HadCRUT Greenland temperatures 0.43°C lower than in the previous post. In this plot, the Modern Warm Period is slightly lower than Alley’s Medieval Warm Period. Figure 3 compares all three datasets. The Kobashi data has been smoothed with a 50 year moving average to make the comparison easier. Alley is unsmoothed and the HadCRUT 4.4 data is smoothed with a 20 year moving average. Both the Medieval and the Minoan warm periods are shifted roughly 50 years between the Alley and Kobashi reconstructions. I take this as the time error (roughly +-50 years) in the datasets. The temperature swings in the Kobashi dataset are more dramatic, but allowing for the time error and resolution differences, generally follow temperature swings in the Alley dataset. Visually, Kobashi’s record has roughly 3x the resolution of the Alley dataset. There are two big differences, the major Kobashi temperature high in 700AD and the major Kobashi temperature low about 550 to 350BC. These differences exceed the apparent error bars of +-50 years and the difference in resolution. Remember both of these datasets were created using the same GISP2 ice cores. What we can do is go to the historical record to see which record corresponds to history better. Figure 4 is the Figure 1 from my previous post, except I’ve added the Kobashi record and corrected the 50 year error. As before you can click on the figure to get a high resolution PDF. Close inspection of these historical events shows that they fit both reconstructions within acceptable limits. The periods where the timelines differ a lot (400BC and 700AD) have no events. There is also a significant gap at 200BC when the Roman Empire and the Han Dynasty were beginning, but that probably does not disqualify either timeline. This is the date where the Kobashi reconstruction hits a peak that is as high as the Minoan Warm Period and over 1.5°C higher than the temperatures we see today. It is also over 3°C higher than the Alley reconstruction at this point. The anomaly lasts 100 years and is precisely opposite of what the Alley reconstruction shows. I’m not sure how to interpret this. This was when Charlemagne unified what is now France and Germany into the Frankish Empire. It was also when the Franks (French) finally stopped the Moslem advance into Europe and held them in what is now Spain. Rashid, sultan of the Abbasid Caliphate, caused the caliphate to reach the height of its power at this time. Great empires are usually built during warm affluent times. I score one point to the Kobashi team. The Kobashi reconstruction shows this as a very cool time about 200 years long (550 to 350BC). Alley’s reconstruction shows it to be warm. This was the time of Buddha and Confucius. Greece fought off Darius at Marathon and Xerxes fought the “300 Spartans” and sacked Athens. This was also the age of Pericles and when democracy was invented. The Huns begin to invade China, the Romans built their first road. Just at the end of this period Alexander the Great defeated Darius III at Granicus. Pretty important times in history. Generally one would think Alley’s estimate of higher temperatures is correct. Score one for Alley’s team. Except for these two glaring exceptions, both timelines can be made to fit with major historical events. We do have to assume that the time error is +-50 years and that the temperature error is +-0.2 degrees C or larger and that the Kobashi resolution is roughly 3x the Alley resolution. Visually, the resolution of the Kobashi data (one-half wavelength of the unsmoothed data) is about 50 years. The resolution of the Alley data is no better than 150 years. After taking these factors into account we are left with two problems, the 700AD difference and the 400BC difference. Both periods are pretty well documented in history and the 700AD difference seems to suggest that Kobashi is correct. But, the 400BC difference suggests the Alley reconstruction is correct. I for one, don’t know what to make of this. I suggest that we remain skeptical of both records and realize that as appealing as they are, they are very rough estimates. Thanks to everyone who commented on my previous post, especially David Middleton who led me to the Kobashi reconstruction. I’m also in debt to Nick Stokes, Ristvan, Andras Gulacsi and David Middleton who caught the 50 year error and suggested I use actual dates on graph axes rather than years before present which are confusing. Anything for clarity. This is how the best science is done. Rapid and insightful debate and discussion. Blogs are great for science, in a way they take us back to the roots of science. Socrates had his gatherings. Mendel and Darwin worked on their own for the love of science and corresponded with like-minded friends. I particularly like the instant feedback of blogs. I’ve published a lot of peer-reviewed papers where I’d nearly forgotten what I wrote before the peer-reviews came back. No fun in that. Plus, the ego factor and bias inherent in the peer-review process is terrible. Blogs are better. June 25, 2016 in Paleoclimatology. ← Why did agriculture start 13,000 years ago? I hope that your work can become “Evergreen”. For example, the two anomalies you cited may be resolved. The work product would therefore be improved. This single slide is a valuable communications medium. I think you need to consider to where on the Earth the measured temperatures are attributed, and also how well that corresponds to the comparisons you want to make. There are many ways that a single site high in Greenland might have temperature trajectories different to Europe, say. And also to coastal (SW) Greenland. But attention is also needed to the isotope techniques. D18O has been used for a long time, and as I understand, responds to temperature where water phase change occurred – probably where it last became vapor (ocean somewhere?). Kobashi’s Ar/N method is much more recent, and as I understand measures diffusion during firn formation etc. IOW, temperature actually at the site, and possibly some way below the surface. NS, your comment has some merit, but only some. All temp proxies have major flaws. Some, like tree rings or varves, more than others. Delta18O and Ar/N included. We can only paint a vaguish picture prior to historical evidence. But that evidence is indelible. Vikings grew barley in Greenland. They buried their dead in churchyards, the bodies now encased in permafrost. Greenland is not the world, but sure is a decent proxy for the NH. Mann was just wrong. And the rest of the CAGW house of cards falls accordingly. AM’s post, and the technical revision here, are admirable contributions to this great debate. I raised this point about d18O being an SST proxy in the last post. I don’t see Andy really addressing this at all here, thoughit’s good that he’s published a revision article. I don’t think this is correct. The archived data states that the raw data has been filtered. Also Andy should explain why he uses a 50y “smoother” for one data set yet a 20y for HadCRUFT4. Presumably he had some motivation for that choice and I suspect it is ad hoc. He should state the reason for the choice. I take this as the time error (roughly +-50 years) in the datasets. Unlikely since the depth / age profile is probably a characteristic of the core and will be the same for both analyses. It should more likely be regarded as differences in temperature proxies themselves. Running averages are notorious for inverting peaks and troughs on scales close to period of the filter so much of the differences in exactly when peaks occur this could also be due poor data processing, both in what Andy does and whatever processing Alley applied. I would also like to see some explanation on how the scaling of the various datasets was done. The factor of three was what ? Eye-balling? Again applying different length filters ( which will have incompatible effects on the amplitude of excursions ) is not correct practice when wishing to rescale and compare datasets. Since one of the key points of interest is relative size of current warm period to previous ones, especially MWP, then data should be processed in as similar a way as possible. Leaving HadCRUFT4 with lighter filtering will provide less damping of the peaks than applying 50y to Kobashi. Then again the scaling seem pretty arbitrary. Some improvements should be made to the method before trying to draw conclusions. The large discrepancy around 700 AD is problematic, it casts doubt on reliability of either or both of these proxy extractions. It’s a pretty huge discrepancy. Greg, Your points are all very valid. I considered doing a spectral decomposition on Kobashi’s raw data to get the frequency content, but decided it was swatting flies with atom bombs. There isn’t enough data and I don’t know enough about it. Alley’s data is already smoothed so such work is pointless. I eyeballed the frequency of each curve and applied the largest filter possible without distorting the curves so that the big features could be seen and the peaks and troughs would not move. Simple as that. Anything more complex would require all of the raw data and a lot of work. Thanks for the reply, Andy. I’m glad you found my comments pertinent. There is no reason why you can not do a freq. 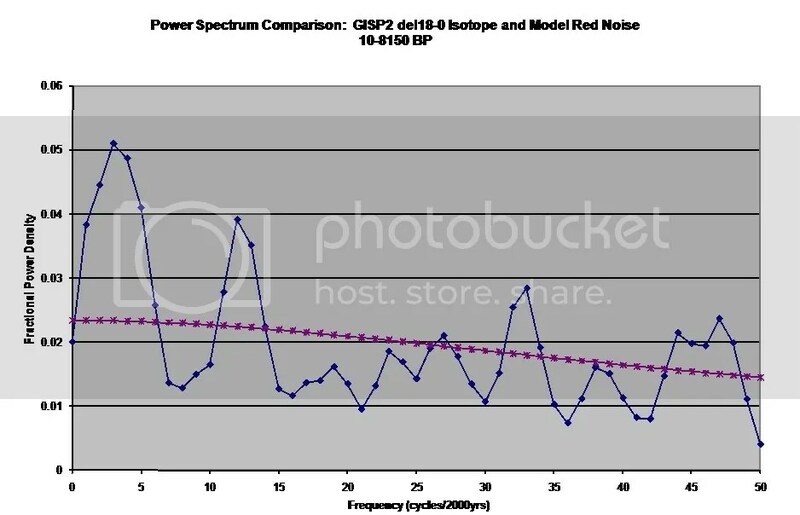 spectrum even if the data has been LP filtered. Though it would best be done with a proper filter like gaussian and not a RM. If Alley does not even know when his data started and ended I suppose he forgot to explain what kind of filter he used. But you don’t need to filter it anyway. Just do the spectra and compare, if that’s what you wanted. One which has less resolution will drop off , so just compare the remainder. You seem pretty proficient with R, so I’m sure there will be gaussian filter you can use with minimal effort. The rather ad hoc method you describe is what I was concerned about. The choice of the fitler should not based on retrospectively matching things up. You could asses the spectral content of Alley if you can not find the original data he got access to. Obviously that would be best if it is archived. If you ascertain that Alley looks to be cut off around 130y periodicity you could apply a similar filter to the other data. Then see how they compare: like to like. If you want to plot HadCRUFT4 on the end of Kobashi, and the latter is too noisy, you should apply similar filtering to both. Trying to assess what different filters give the “best” results probably indicates that you are imposing some of your own preconceived exceptions on what the outcome should be. Obviously applying the same philosophy means filtering HadCRUFT4 to compare with Alley would only leave you with about 1 data point for the thermometer data. This is not contradictory but shows why all these studies like Marcott et al are bogus. They are comparing data that are not comparable. Recent data will have larger swings because it has higher time resolution. Thus saying it is warmer now that for x-thousand years is BS. It apples and oranges. I’m none too sure of your interpretation of the period around 400BC as “good times” for civilization. You do note that the Huns were invading China around that time – which fits the northern barbarians being pushed into warmer regions by worsening climate. The Mediterranean basin, true, wasn’t experiencing major upheavals at the time. But the previous wave of barbarians had civilized during the preceding good climate era, and were nearly at the peak of their power; also in a region less affected by climate swings. Note that the Greeks were still experiencing pressure from the Macedonians and related peoples – and the Etruscans from the Gauls (which conflict Rome eventually inherited). My thoughts, too. 700AD was associated primarily with empire-building, 500BC with invasions. On Andy’s scoring system, that’s 2 points to Kobashi. But I think the scoring system is a bit of a “fetch” so it would be rash to give it any credence without independent supporting evidence. It looks like different proxies for temperature yeild different temperatures sometimes. I wonder how much the two major disagreements in estimated temperature reflect the different proxies, and how much is due to purely local weather in Greenland. One question could be: is there a natural phenomenon that could cause isotope ratios between oxygen and argon/nitrogen to differ other than temperature? I.e. They are respirated and metabolized differently be both plants and animals, they dissolve differently in the oceans, or they are affected by solar radiation differently. Do the anomalous peaks/valleys correspond with known solar maxima/minima or volcanic activity? Off topic, but if you are worried that, thanks to Global Warming, your children will never know what snow is, just send them to …er… Australia. Right now I am wearing a t-shirt, a flannel shirt, anda sweatshirt, and I am still cold. This might be normal in whatever dismal part of the world you live in, but I am in sub-tropical Brisbane! Should I blame Brexit? Why not blame Brexit? Everyone else is. Myself, the hair loss started about when the EU was formed… Maybe I’ll get some back now? Correlation, you know, is always causation. 1. I was one of those critics you explicitly referenced. I applaud you for this now. 2. I underwent the same experience over at Climate Etc. concerning a (2013?) post on sudden Eemian SLR. There, Judith published my corrigendum after a brutal 12 hours being pounded as obviously wrong in a minor imtroductory paragraph. My own take on all this is that forums like WUWT and CE are much more brutally honest, much more rapidly corrected by crowd sourced knowledge, and therefore much more reliable than standard old fashioned peer/pal reviewed clisci. Many kudos. Highest regards for publishing in the most brutal fora possible. Plus, see my previous very supporting explicit comments to your general post’s idea. Thanks. As you say, the main conclusions of the previous post are still sound. But, the details are important, as is speed. Blogs work. The starting point of the Alley curve is quite confused. 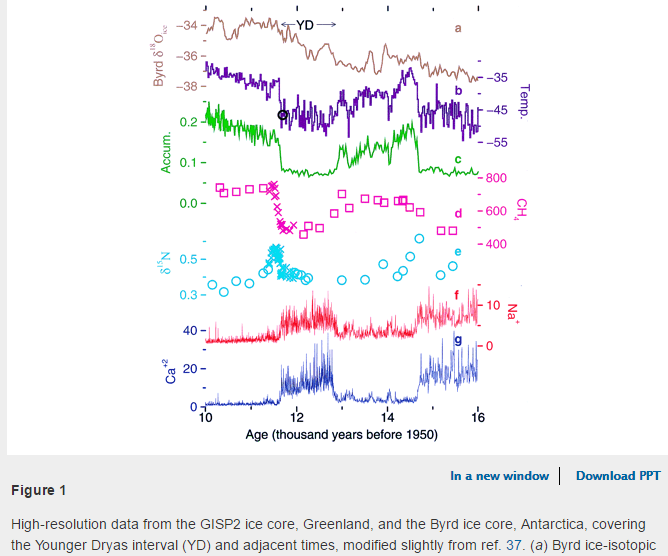 The original data comes from the GISP2 ice core which begins at 1950. So ‘before present’ means before 1950 for the core. Alley’s curve is based on the previously published data and curve of Cuffey and Clow (1997). Alley states “Data are smoothed from original measurements published by Cuffey and Clow (1997)” The Cuffey and Clow (1997) doesn’t say exactly what ‘before present’ means, i.e., is it the top of the core (1950 AD)? The Alley curve begins at 95 years ‘before present,’ but he doesn’t say whether or not ‘present’ is the top of the core. Because he uses the data and curve of Cuffey and Clow (1997), presumably they both use the same ‘before present’ starting point. The catch here is the question of whether or not Cuffey and Clow used 1950 as ‘present.’ Alley’s first data point is 95 years BP, so if 1950 is ‘present’ that would mean his first data point is 1855. But his original paper was published in 2000 (updated in 2004), so ‘present’ could conceivably be 2000 which would mean his first data point would be 1905. In trying to clear up the confusion, I asked Alley about all this, and his response was that he wasn’t sure. To digress somewhat: Nick Stokes says, correctly “BP (Before Present) is a standard scientific term“. But I really don’t think it is correct to say there is “no confusion“, since the BP date is only set at 1950 “by convention”. To my simple mind, BP is the stupidest “scientific” term ever invented, because the P in BP is a variable. It would have been better to call it say “van der Plicht time” and define it as starting on the date when x occurred, if a suitable x can be found (maybe the “official” date on which vdP&H thought of it). To have the convention that it starts in 1950 solves nothing because the point of BP as I understand it is to avoid reference to a relgion – yet “1950” is only by reference to the same religion. BP isn’t really scientific at all, it’s PC gone mad. No, it's nothing to do with that. It's a fixed starting year, exactly the same as 1AD, as we've used throughtout history. One reason for adopting it is simply that it saves mental arithmetic. If you are talking about, say, early Holocene, then if you say 11250BC, you have to add 2000 to figure out how long ago. If you say 13200 BP, you probably won't bother adjusting for the years since 1950. It came in with carbon dating, where the idea is that you calibrate with a 1950 standard. Can't use much later because of nuclear tests. In fact, I think they use a late 50's sample which they have to adjust, but not by too much. "Before Present" means before 1950. The most commonly used convention in radiocarbon dating. "Present" referring to the year 1950 AD. Cuffey and Clough, as I’ve noted, clearly states “BP” used was 1950, and they show the data start date a “-37.5 BP” or 1912. Alley 2000 shows start data as -95 BP … which using 1950 as the BP date is 1855. Unless Alley 2000 simply discarded 57 years of the most recent data from Cuffey and Clough 1997 data (that Alley clearly states Alley 2000 is directly from), which would raise another whole line of questioning, then there is a significant problem with Alley 2000’s true start data date. You’re the expert here (at least compared to me ;-) …). Is the Alley 2000 data useful/useable if there is a 57.5 year unknown in the actual data age/dates? Nick – OK, I’m quite happy to accept everything you say. But it’s still nuts. Saving mental arithmetic when the period involved is an insignificant 66 years only sows confusion when the period involved is a significant 66 years. And next year that goes up to 67 years – a tad more significant. By 2050 it’s 100 years, and soon it will matter for everything. And all the time they still have to remember “1950”. Obviously they should at the very least change the name – or will they treat it like the climate temperature anomaly system and move the base date up from time to time so that it is always near enough to ‘Present’ that they can ignore it except for the things that they can’t ignore it for. Can you really see them in 2116 or 2216 happily calling 1950 the “present”. Wouldn’t it make it all a sight easier if, whenever they needed a date, they just used the date? I’ve shown above the Fig 1 that is referred to in the notes that you quote. It spells out 1950. But another thing to note is that it shows the period from 10K to 16K BP. That is what he was writing about. And I think that is why he wasn’t very interested, either in the text of the paper or email, in hassling about the initial data points and the exactitudes of BP. I asked Alley about all this, and his response was that he wasn’t sure. These guys are priceless. They don’t even bother finding out zero of their timescale before reusing someone else’s data and publishing several articles. No one in peer review seems to pick up the fact that a fuzzy term like “BP” is not defined in the paper. Thanks for that information Don. I’m glad I did not waste half a day trying to research what that meant when the author himself does not even know ! I guess he does not know filtering he applied either. Thanks for the history Professor Easterbrook. I also looked for some sign of the starting point, more than once, and never found any evidence. Kobashi was kind enough to use actual dates. There is a lesson there. And, yes, while I did no additional smoothing to Alley’s dataset, he did filter his data pretty severely. I spent a fair amount of time trying to get to the bottom of the Alley 2000 start point. Alley has stated he used Cuffey and Clough’s data. While there are other questions in the Alley 2000 dating, we DO know the Cuffey and Clough “BP” date. They state the start data point is “-37.5” BP – before 1950 … so their start point was 1912. This shows the dilemma with Alley 2000. Alley 2000’s data set show no similar definition of what “BP – Before Present” signifies in his work. If Alley DID use Cuffey and Clough AND he used the “convention” BP of “1950” then his start point of -95 BP presents a problem, as that would represent 1855 vs Cuffey and Clough’s known 1912. There is at minimum a 57.5 year discrepancy in Alley 2000 (1855 vs 1912) which would seem to render the entire paper minimally valuable. This shows a serious problem with the attention to detail and documentation of some of the science and scientists of late. That the author of any scientific work cannot clearly state what the data represents, and/or has no records which can confirm the answer is a really big deal IMO. And it’s not the first or only time this type issue of documenting prior work has arisen. It seems we’ve seen too many “the dog ate my homework” type excuses when it comes to providing documentation. Andy, I think the Kobashi data is the one showing deviations. Other data indicates that around 400 BC the Mediterranean enjoyed generally favourable conditions, after the climatic crisis that followed the Late Bronze Collapse that gave place to a cold period coincident with the Greek Dark Ages, between about 1200-800 years BC. By 400 BC the climate was improving and entering the Roman Warm Period. 400 BC is in the middle of the Greek Classical Period, a golden age for Greek civilization. Whereas 700 AD appears to have several indications of a difficult climate period. It is after the Roman Warm Period, and within the difficult period known as the Migration Period (Völkerwanderung), that takes place between 376 to 800 AD. Usually great movements of people indicate bad climatic conditions. 700 AD is within Bond event 1 at a time of glacier advances according to Mayewski et al. (2004). Independent confirmation that 400 BC was a relatively warm period and 700 AD was a relatively cold period is obtained from Geirsdóttir et al. (2013) that record paleotemperatures for the last 10,000 years in sediments from Icelandic lakes. Modern Warm Period: 1850 AD-Now. The temperature record better corresponds to history – and now shows modern times about as warm as the Medieval warm period instead of warmer. But the problem remains – there is a splice of two different types of temperature data. One is derived from Greenland Ice record and one is the HadCRUT 4.4 record. Even if you do the adjustment mentioned above, there is no good reason to believe that the Greenland ice record can be compared in that way. Additionally, HadCRUT 4.4 is a highly manipulated temperature record and the manipulations are done for political purposes. . Thanks Don, I pointed that out in comments to the last article with a link to the archived data stating that. I think what Andy was meaning was that he had not applied any smoothing to Alley. But he should state clearly that the data was already smoothed. are worth including then the chart is purely subjective. And trying to claim that you can determine the accuracy of a climate record using “major historical events” also seems bizarre and internally inconsistent. If the 400 BC corresponds to the rise of the Greeks then the temperature should be warm but if it is the demise of the Persian empire (bigger and longer lasting) then it corresponds to a colder climate. Similar is 700 AD the rise of the Franks or the demise of the Moors? And where is the evidence that great empires are usually built in warmer affluent times? Empires are usually built on the remains of previous ones and so you can just as easily argue that the demise of empires occur when the living is easy and so the ruling class becomes decadent. I would suggest you read Behringer’s book. My posts (from a historical standpoint) summarize his work and I leave out a lot of rich detail. He discusses the accuracy of historical dates, more quantitative measures (such as the temperature required to freeze lakes and rivers, glacial advances and retreats, etc. He also includes information about the Aztecs, Maya and Indonesians. Don’t judge this technique just on my brief summary. History contains a lot of very useful data on climate that we desperately need. In 2000, Richard Alley released an ice core temperature reconstruction for Central Greenland using Oxygen isotope ratios. Both plots do not match which suggests one or both are using inadequate assumptions and\or measuring techniques. Not sure about the measuring technique idea, one has to find an area which has never gone above zero [no melt] for 4000 years to get an ice core of any validity so has to be cold and high. Air at this latitude is also subject to polar amplification so changes would be amplified relative to warmer places in the world but the two techniques should not be measuring different amplifications, should they. A single point over 4000 years is a global average, and always will be. – Anomalies are never “better”, they are what they are. Better is a term only used by people trying to match an anomaly to their own pet belief. Because of differences in the Northern and Southern Hemispheres an anomaly reconstruction of temperatures over the last 4000 or even 40 years is quite different in contrast to each other. Nonetheless due to the lack of ice traps over most of the world the two reconstructions above are each among the best guides to Global Average Temperature that currently exist. The best advice in trying to match official history to either graph is don’t. But do put up the tree rings and compare the anomalies. Both show that temperatures varied a lot more in the recent past than a Mann could ever dream of. Nick has explained the difference in the two datasets. The O18 data is a proxy for global temperature, the N/Ar data is a local proxy. There is no reason to expect that those two would be equivalent over the time range of smoothing. If you are going to tack thermometer measurements onto the proxy, the HADCRUT4 global average should be the one tacked on to the Alley data. That would give the same general result that the current warming is less than the Medieval warming. Not global, I think. It responds to the temperature where the precipitated water entered the atmosphere as vapor – probably seas around Greenland. so you “spliced” 2 different types of temp reconstructions ? really ? Yes, and he explained why, where and how. Its called honest science. I’ve published a lot of peer-reviewed papers where I’d nearly forgotten what I wrote before the peer-reviews came back. No fun in that. Plus, the ego factor and bias inherent in the peer-review process is terrible. Blogs are better. I’ve looked very closely at Greenland data. If you are interested in long Greenland data, I strongly suggest that your perspective be based on the data and analysis of Vinther et al 2009. GISP2 d18O data is available into the 1980s and should be consulted. Alley’s temperature reconstruction was some sort of combination of d18O and borehole temperature inversion, which is not used by anyone else. Nor is its methodology explained anywhere enough to be replicable. It differs from the isotope series. This also serves to moot Nick’s insistence everyone uses the convention of 1950 for years “Before Present” … you have to verify each data source. Thanks Scott. Like I said it’s fuzzy. Sorry Nick. Not true. BP means before 1950, and in Alley’s work he makes that perfectly clear. Vinther chooses to use 2000 as a reference point, and makes that clear by calling it b2k, not BP. As Nick has pointed out the convention in radiocarbon dating is that 1950 is the ‘present’ in the term ‘before present’ (BP). One of the reasons is the need for a calibration standard to cross calibrate measurements done by different instruments, because of the perturbation in the atmospheric values caused by extensive nuclear testing material from before that activity was chosen, hence the 1950 date (see below). Easterbrook made a mistake when he plotted Alley’s data and this error has been perpetuated by others. I tried to read the Vinther et al data but ran into a paywall. My wife insists that her kitchen cabinets come before my hobbies. Can you help? What on earth are you doing ? Putting climate research up to public scrutiny for comments , this is not how it’s supposed to work . No mention of 97% none of the other get out vague clauses and where is the pitch for govt funding at the end . 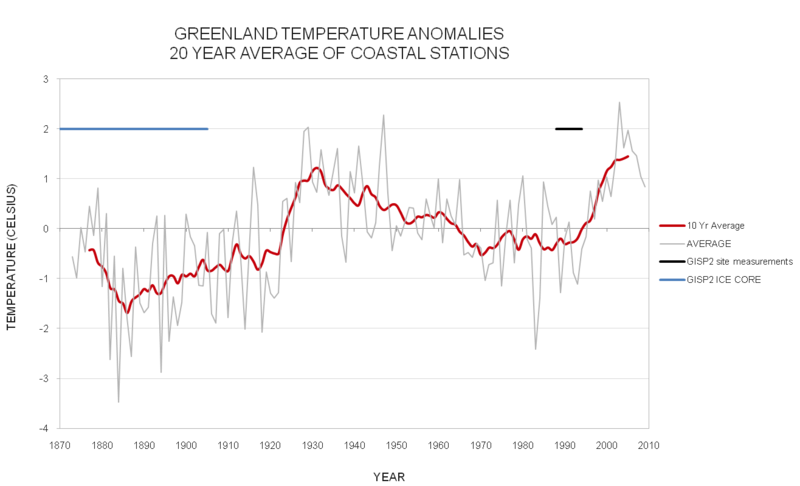 The Greenland temperature reconstructions have been SCREWED UP for the past 30 years. They are WRONG and need to be redone. To see what i mean, let’s first look at the temperature changes over the last ice age from Antarctica, Greenland and then what the Global temperature change is. –> Greenland as low as -25C ???. First thing to note then is that if you are comparing Greenland to global temperatures, there is a a factor of 5 polar amplification factor. You cannot compare GISP2 from Richard Alley to Hadcrut4 without dampening down the variation in GISP2 by 80%. Most importantly, the Greenland dO18 isotopes DO NOT USE the real dO18 formula that should be used to convert to temperature. They are using some probably incorrect BOREHOLE model. But the Greenland ice core scientists DECIDED they would use a different model of borehole temperatures instead. Warmth is building up from the bedrock below and slowly makes the ice warmer. Based on a model, one can figure out what the temperature of the ice was when it formed at the surface (let’s say -51C), while now it is down 500 metres and it is now -32C. They redid the dO18 isotopes conversion formula (from the international agreed upon and very strictly measured VSMOW) to a new one of this. This is a result of Cuffey and Clow 1997 but mostly Johnson and Dahl-Jensen 1995 (who were the mafia of greenland ice core science at the time). A borehole model can be correct but they have huge variation in the results based on the assumptions used. Get the assumptions wrong and the model can be off by more than 100%. 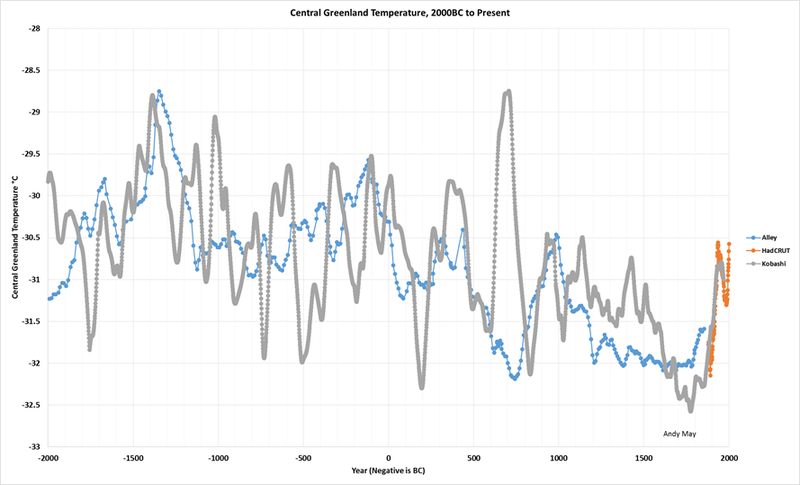 –> Greenland recalculated as low as -9C in the ice ages. Thanks Bill. Yes deconvoluting a bore-hole temperature profile back into a temp time series involves to many unknowable quantities that it is a total joke. The result really depends mostly on what you “expected” to be before starting. When I first read about this, I could not believe it was being seriously suggested. GreenLand is not the world. 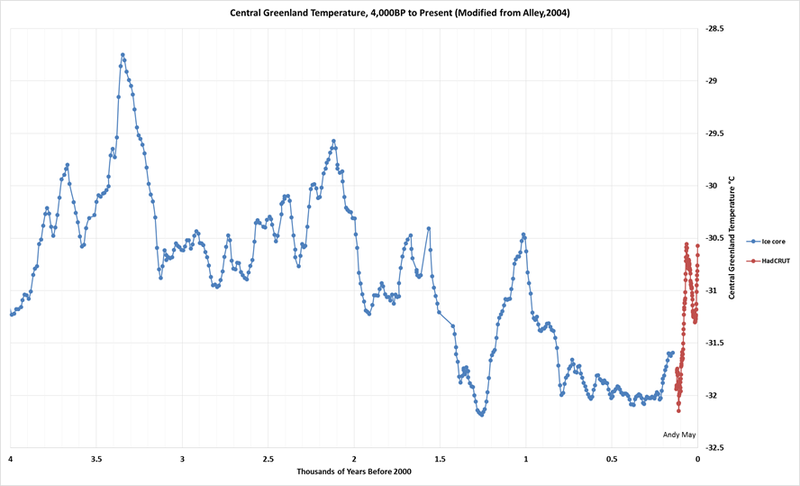 The correlation between Greenland temperature and global temp is rather pathetic. Using historical events from random places to decide which record is “better” is voodoo science at best. HI Mosh’ , you seem to be replying to something that was not mentioned, discussed or even implied here. Perhaps you are thinking of another thread. Alternatively, if you are replying to Andy’s article, that is what is commonly known as a straw man tactic. In that case the melting of ice on Greenland has no implications for global warming. Odd that CAGW-ers still use it as a poster child. The correlation of Greenland surface temperature to the rest of the planet is low. As usual, total BS. There is a stunning correlation between the GISP (Greenland) ice cores and the Antarctic cores (EPICA and Vostok). Well I guess you must be smoking Camel, but instead of insulting Mosh’ why don’t you post up this “stunning correlation” , go on stun me. Even a correlation coeff if you know what one of those is. Since very few people seem to be making objective fact based statements any more, I will not be stunned until I see some facts. It would be better to counter Mosh’s claims with some facts rather than vague assertions and insults. I would not worry about these 50 year differences, as the gas-age of the ice can blurr the temperature data over potentially hundreds of years (some say thousands of years). The gas bubbles do not stop diffusing with orther ice layers, until they are well down below the firn level in the ice. So the precise age of some of these peaks and troughs are open to a great deal of natural smoothing, and a great deal of interpretation. In the context of this data, both the Alley and Kobashi reconstructions, 20th century warming looks spectacularly unexceptional. In fact it is exactly what would be expected to continue the pattern. A kind of graphic IQ test. A test that the warmists, needless to say, fail emphatically. The Kobashi reconstruction makes 20th century warming look like the last hurrah before glacial inception. You are aware that we have the climate records of the Byzantine empire( the roman eastern empire) covering much of the period you are interested in? Mind you, I do not share the certainty that seems to be expressed that Greenland is a good proxy for the globe or the NH. Greenland weather seems to often be quite different to what is experienced in Europe. Whether that equates to meaningful climatic differences between those two regions over the requisite 30 year period I don’t know. Lamb and many others suggested that CET was a good proxy for global or at least NH temperatures. Do you have a similar roster of scientists that can validate that Greenland is a meaningful proxy? Great Empires are usually built during warm times ? Do you mean locally warm times ? Way I see it is there are two pretty significant incorrect points in both reconstructions and the reasons are not identified which would mean as it stands we cant use either to make any point until the issues are resolved. Just as with Mikey chopping off bit that disagreed with thermometers in Briffa’s reconstruction, simply deleting or in this case excluding these inconveniences doesn’t change the fact that in all cases the inconveniences bring the entire reconstructions into doubt. My issue with your approach is this: if you want to compare the 20th century to the past, you have to have consistent data through the period. If you splice a O18+borehole combination with one period with a N-Ar proxy in another period, you don’t know what you have. Better to take an O18 series that reaches through the 20 th century so you can at least determine whether there is anything unusual with the proxy. Attempts to use the Alley reconstruction to compare to the 20th century are a waste of time, since the comparison depends on the splice. That’s one reason why the Vinther data is better. One reprehensible issue with Greenland ice core scientists is their determined failure to publish/archive updated d18O data. The most recent data when I looked last year came no further forward than 1995 or so. The modern generation is even worse about archiving data than the ones that I’ve criticized. A big part of the revolution that needs to happen in all regime-funded research but especially “climate science” is the requirement to archive and make public all data collected as a result of public largess. Maybe President Trump will make this a part of his overhaul of Big “Science”. We both used Richard Alley’s data but did not buy idea that [CO2] is the control knob for global temperature. Six years ago I made a couple of “Guest Posts” that are in remarkable agreement with yours including the 55 year error in splicing the GISP data to measured data. In spite of our disagreement Richard Alley was approachable and helpful unlike his litigious colleague (Michael Mann) at Penn State. I would appreciate an opportunity to correspond with you “Off Line”. If you like this idea my public email is info(at)gallopingcamel.info. Your problem is that you bore everyone to death with minutiae. Once in a while you need to look at the woods rather than the trees. Please excuse a nit pick, but the Roman Empire per se didn’t begin at 200 BC. The Roman Republic had already long been expanding at that time, but the Empire wasn’t officially established until 27 BC. The Punic Wars between the Roman Republic and Carthage occurred between 264 and 146 BC. The GISP site has an altitude of 2,316 meters rising by about 0.05 meters per year. Unfortunately the GISP ice core data only goes back 80,000 years because the site was ice free during the last inter-glacial. Fortunately, Antarctica has maintained its ice sheet for at least 850,000 years so we can look back much further than the DYE and GISP cores allow. Over the last 850,000 years global temperature has correlated with [CO2] to an R>0.95 thanks to Henry’s Law which governs the solubility of gases. As the oceans warm they release CO2 which explains why temperature leads [Co2] by 500 to 800 years. In my world cause precedes effect……..
You have never been known to admit that you are wrong so don’t waste my time with your sophistry. It is time to present real data and mathematical analysis. too funny. you understand that the lag is actually a consequence predicted by the science… in fact Hansen predicted the lag before it was discovered. C02 in the atmosphere is both a cause of warming and a response to warming. Your problem is that you refuse to be confused by facts. Henry’s law explains the lag whereas you are peddling Hansen/Severinghaus sophistry. I have concentrated on the variation of global temperature at high latitudes because I believe in polar amplification. Averaging temperatures that vary over a range of 100 K to an accuracy of o,1 K is not easy so it makes sense to monitor temperature at high latitudes. IMHO polar amplification is in the range of 3 to 5.
gallopingcamel , I would have commented on your links provided above but you have comments closed. Firstly, not only do you make the same BP mistake as Andy but also the same poor choice of filter. You don’t seem to notice that you have troughs in your “smoothed” data when there are massive spikes in the unfiltered data. Typical RM corruption of the data. You don’t seem to notice that you have high frequency wiggles in data you imagine you have “smoothed” at 10y. You also incorrectly label these lines as “10y average”, not running average. A 10y average would have less dots and would be more defensible. You also confuse the ten “resolution” of Alley’s data ( which is depth resolution of the slicing ) with resolution of the physical processes: gas diffusion in the firm etc. , so this is not real time resolution of the proxy. Again you end up with far more excursions in your “10y” filtered data because the proxy is far more heavily damped. 10y is not the true resolution of that record: hence your hockeystick. You say you ‘believe’ in polar amplification. See whether you can find any at the south pole…. As you point out Andy and I made the same mistakes. We are amateurs writing without the benefit of “Peer Review”. Richard Alley was gracious enough to point out my errors in “off line” correspondence five years ago. Even though I disagree with Alley’s conclusions I hold him in the highest regard as he is not afraid to engage in discussions with the general public. During the PETM sea sediments show that polar oceans were 12 K warmer than today. Sediments from low latitudes suggest 3 to 4 K so the amplification appears to be in the range 3 to 4. Over the last seven glacial cycles the temperature excursion at high southern latitudes was 13 K which is much greater than the 3 K GISP excursion for the last 80,000 years. Thus if you use south polar data an amplification factor of greater than 5 seems plausible. Look at the spikes in the unfiltered data 1915, 1930, 1946,1982,2003 . All these are inverted by the defective RM “filter”. You also have ripple on the scale of 1-2 years after supposedly filtering with a 10y filter. Try to find yourself a gaussian at least. See my climategrog links above. I provide scripts for doing filters. This makes me wonder whether the absense of the 700 AD spike in Alley be filter induced. My math tutor at Cambridge was J.C.P. Miller, a statistician. He seemed quite pleased with my progress but I have not had much occasion to use statistics since graduating in 1961. Given the huge advances in numerical analysis since then I have no doubt that you could do a much better job on the GISP data. No need to reinvent the wheel. Kobashi already invented it. Just use Kobashi. HadCRUT is crap. It is unreliable and dubious. As I said before, HadCRUT points are in the coasts and on sea, which are warmer than the ice sheet in the middle of Greenland where GISP2 is located. Not to mention the “man-made warming” due to HadCRUT data adjustments. It’s clear from Kobashi that the 1940s is warmer than the 1980s up to 1993. I’m not sure if you got it in your reconstruction using HadCRUT. This presentation accepts the “Consensus” view that the GHE is ~35 K. That estimate is not even close as it makes unrealistic assumptions about the thermal properties of planetary surfaces.. I can agree that the average global temperature is 288 K. However, global temperature “Sans Atmosphere” cannot be ~255 K as “Consensus Scientists” tell us. A more realistic assumption would be 209 K for a regolith surface or 234 K for an ice surface. Greenland and European temperatures have varied inversely through the Holocene. The 8th century according to proxies was the warmest part of the MWP for Europe, so would have been very cold in Greenland, as the Alley series shows. Alan: Interesting post. Your post reminded me that temperature proxies are not temperatures and that consensus climate scientists rarely discuss the dubious reliability of such proxy data when it supports a position they favor. Kobashi eventually published a non-paywalled on temperatures deduced from Greenland ice cores and various isotopic methods and the figure hopefully shown below is comparable to yours. This Figure and your work shows that even a 3 degC deviation in a single proxy record (such as the one around 700 AD) may not be real – or at least not be meaningful in terms of global or hemispheric climate. For that reason, I think your attempts to decide which record is “correct” based on events in human history – which may of may not be associated with large scale climate change – are doomed to failure. There is no right or wrong answer just a collection of dubious proxy data that is mostly in agreement about major events (the 8.2 kya event, the Younger Dryas, glacials/interglacials), but isn’t in agreement about the modest swings over that last several millennia – especially quantifying the amount of change that occurred between warm and cool periods. Looking at the warm and cool periods shown at the top of Kobashi’s Figure 3, I’m not convinced that there was a Dark Ages Cold Period, a Roman Warm Period, an Iron Age Cold Period, and a Bronze Age Warm Period – even in Greenland, if not the NH or globally. Perhaps the data from Antarctic Ice Cores or other proxies paint a more consistent picture. The only exception to this generalization is borehole temperature measurements – which are real measurements of temperature. Unfortunately, they lose resolution in the time domain and don’t provide useful information further back than the MWP. Frank, thanks for your comment. I had looked at that paper and I notice the Bo Vinther is a co-author, which is helpful. I think Kobashi’s comment that temperatures are lower now than 4000 years ago is a valid conclusion. This is clear in all reconstructions. What else can we tell? Hard to say without more work. Andy: I’ve decided to ignore any single proxy record and only pay attention to a panel of records. Don’t show me one ice core that says that the Roman Warm period was warmer than today, so me a panel of five or more proxies. If global, some from Greenland, some from Antarctica and some from ocean sediment cores. That makes is difficult for amateurs to be convincing. FWIW, Kobashi’s N/Ar methodology appears to be more problematic than O18 temperature proxies. O18 is fractionated as it moves from the ocean to air above an ice cap and when it falls as snow. That leaves plenty of room for changes in O18 that aren’t caused by temperature, but once the O18 is in ice, it shouldn’t change much. N/Ar involves two mechanisms of fractionation in the firn and then the possibility of fractionation after coring from air bubble and from within the ice matrix. The nature of the ice changes with depth and – if you go deep enough the ice begins to flow. A 2016 paper demonstrated that the N/A method is biased by accumulation rate. too different, especially the wild Kobashi variations between 1200 BC – 200 BC. even better seen for the time span 1 AD to 800 AD, which will be part 6, out in short time. Argon components, which are settling peu-a peu in the ice after each cosmic meteor impact. Holocenene temperature proxy and stick with Alley. Check it out. Questions welcome. JS. Note that there are at least three peaks in the multi-decadal range, which would be adversely affected by a 50-yr moving average. Decimating all data to the sampling rate of GISP2 would make for more meaningful comparisons. “Well I guess you must be smoking Camel, but instead of insulting Mosh’ why don’t you post up this “stunning correlation”. I was not insulting Mosher (I’ll take care of that later)………I was pointing out that he is wrong. Stunning correlation between [CO2] and temperature can be found in papers relating to EPICA, Vostok, GISP and DYE. I have linked several of these in my comments above. Please take the time to read them and let me know if you agree or disagree. Now that you have some of my numerical analysis, how does Mosher’s compare? Does he have anything at all? He seems to be into hand waving and ad hominem. I imagine he is a really crabby old guy without a kind word to say about anyone. and noting that ice ages are not exactly accommodating to any sort of life form, don’t you all have to admit that we are lucky to be in this prolonged period of warmth? planned creation or planned chaos?